The dawning of desire is delicious and dangerous.1806, Scotland. Wild, reckless Callum MacCreath is in no hurry to become someones husband. But when his responsible, steady older brother Ian announces his engagement to their childhood friend Rebecca, Callum makes a startling discovery: he wants the lovely young lass for himself. But its too late, and when Ian banishes him for his duplicity, Callum is only too happy to leave Scotland forever.1816. Marrying Ian was the practical, logical thing for Becca to do. But once Callum sailed away to America, she missed his rakish charm and lust for life. Now Becca is a widow when a much-changed Callum returns to his Scottish homeland. Will he remember their spirited, fiery connection or does he blame her for his brothers unexpected death? This time neither of them can deny their scorching attraction. But will their hearts be burned in the blazing heat of scandal? In the next installment of Keira Montclair's Clan Grant series, Laird Quade Ramsay fights his feelings toward the only person who can save his young daughter. Contains mature themes. 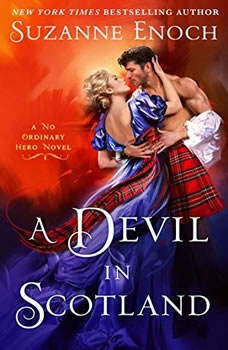 In a new series by bestselling author Keira Montclair, Laird Alexander Grant vows revenge against Madeline MacDonald's abusers, but can he help her fight the demons in her mind?